Fiberglass composition asphalt shingles are the most commonly used roofing material today. Many consumers, however, are unaware of the alternatives that may better suit their needs and budgets, reinforcing the importance of considering one’s roofing options before committing. Below, we explore asphalt shingles and one major alternative, Gerard roofing systems, to help you decide which is best for your next roofing project. How will each material improve the look of my home? Both fiberglass composition asphalt shingles and metal roofing systems by Gerard are available in many types and colors. The appeal and color versatility of asphalt shingles can be attributed to their exterior colored stone chips. However, the material scars easily in the heat and the paint is vulnerable to chipping, giving many homeowners only a short time to enjoy the appeal of their new asphalt shingle roof. In addition to this downside, asphalt shingle roofs don’t have the dimensional look of tile or shake, which roofing systems by Gerard can achieve. By comparison, Gerard metal roofs are stone-coated for aesthetic appeal. However, unlike asphalt shingles and their mediocre paint application, these options provide homeowners with durable, lasting roofing systems thanks to Gerard’s top-quality materials and intricate process of applying their coatings. The stone-coated metal roofing options from Gerard offer benefits, ensuring paint wear prevention, UV protection and more. How do the prices of these materials compare? Typical asphalt shingle roofing systems have lower purchase and installation costs than metal roofing systems. However, comparing the price of low-grade asphalt shingles with the quality of Gerard steel shingles would provide a skewed outlook. Architectural fiberglass composition shingles are the more dimensional and better built asphalt option, comparable to Gerard’s Granite Ridge steel shingles in price. However, Gerard steel shingles outperform asphalt architectural shingles in all areas. These high-end asphalt shingles still pose the same problems as their lower grade counterparts, but with a higher price tag. In fact, the presence of asphalt shingles (of any kind) is often used against homeowners during resell negotiations. With metal roofing systems, homeowners save expenses they would have had with asphalt shingle roofs in maintenance, replacement and energy costs. Moreover, homeowners with Gerard roofs have the peace of mind that their property values have increased rather than suffered as a result of choosing lower performing alternatives. What protection does each material offer and for how long? Before committing to asphalt shingles for your roofing updates, consider the climate-related tests your roof must withstand. Asphalt shingle roofs are one of the shortest-lived building components of many homes, with an average lifespan of only 10 years. They provide little protection against regional environmental conditions, including being highly susceptible to dislodging in high winds. Some asphalt composition shingle manufacturers do not honor warranties in hot or humid locations because of the continuing rise in oil prices that has incentivized manufacturers to change composition and filler materials, resulting in lower quality products. Issues associated with low-grade filler materials include moisture absorption, warping, curling, fungus and mold growth. The short life-cycle of asphalt roofing creates a large negative impact on the environment in land fill disposal. Unlike asphalt shingle roofs, Gerard metal roofs are made to last a lifetime despite testing conditions and harsh climates. Gerard’s Galvalume® steel shingles are coated and interlocked for top-notch protection, resistant against leaks, hail, high winds and fire, explaining why they’re typically accompanied by generous warranties and homeowners’ insurance discounts. Asphalt shingles, on the other hand, are not as apt at withstanding the effects of extreme conditions, making them temporary solutions to roofing problems: they are flammable, vulnerable to ripping and tearing, and frequently lose stone over time. The strength and durability of metal roofs affords them immunity from many of the issues that plague asphalt shingles. Thus, choosing a metal roof will likely reduce the money, time and stress spent on future maintenance. What about the materials’ respective effects on the environment? Not only is a metal roof’s strength a testament that it should be the choice for your next roofing project, but its environmental soundness and energy-saving credentials are as well. Unlike asphalt shingles, metal roofing materials are 100% recyclable. In addition, Gerard products are made from over 30% recycled steel, supplied by equally green-conscious facilities. Gerard also provides options that naturally create an insulated air barrier, translating into annual energy cost savings of up to 40% for homeowners who have opted for these systems. On the other hand, asphalt shingles’ heat absorption factor limits their potential energy efficiency. 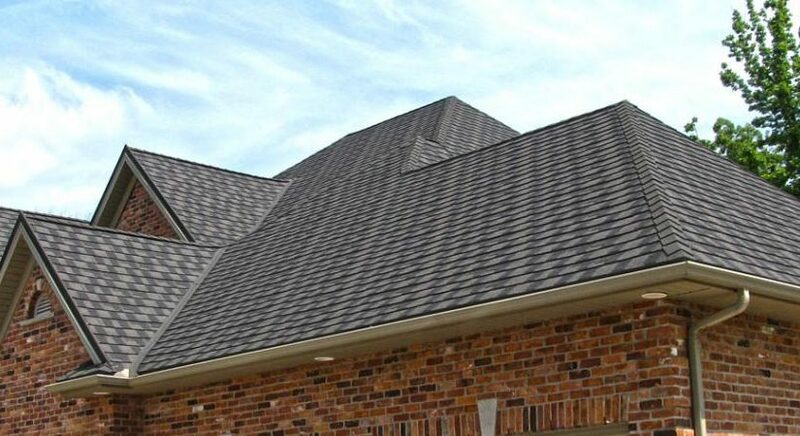 For the past seven decades, asphalt shingles have been the predominant roofing material employed in residential projects due not only to their low cost, but also to consumers being unaware of alternatives. A stereotypical standing seam or corrugated image may come to mind when thinking of metal roofing; however, quality metal is much more than misconceived notions lead one to believe. Gerard provides top-quality roofs that are just as, if not more, beautiful than your neighbors’. Residential metal roofs now project the beauty you want to be associated with your home. Unlike with asphalt shingles, the selection of metal roofing profiles is not dull or redundant: from standard color options to Energy Star-qualified colors, you will find something to suit your aesthetic desires without sacrificing performance. Not only are Gerard metal roofing systems outstanding investments, they will also be the last roof you’ll ever need!